Welcome to Sendak ! Please support our school and submit all your boxtops to the office or online at www.boxtopsforeducation.com. For every boxtop that you submit our school receives 10 cents. We thank you! Support Sendak Elementary when you shop at Amazon.com through this link. We will have an Early Transitional Kinder Expansion program starting August 20, 2019. If you child turns 5 between December 3, 2019 and June 30, 2020 he/she may qualify. Children must qualify for the free and reduced meal program in order to be eligible for the program. Please come and enroll between 9-11am and 2-4pm. Thank you. An Expanded Transitional Kindergarten to 5th Grade school, Sendak Elementary is committed to the education of the whole child so that each may develop his/her maximum potential academically and to be a productive citizen within our diverse global society. To ensure that all our students succeed, we ask four things from our parents: 1) Bring your children to school every day and on time. 2) Have conversations with your children about what they have learned in school on a daily basis. 3) Check their homework every day. 4) Read with them for at least 15 minutes a day. We look forward to working with all our parents in providing a quality education that meets the needs of all our students. Thank you to all the YMCA volunteers and the Sendak Community, including parents, students and staff, who joined us for National Clean Up Day on September 15th, to help "beautify" our Sendak Elementary campus by cleaning, planting, and painting. We all came together to volunteer because clean communities build stronger communities! Coming in 2019-2020....Where the Wild Ones Play! 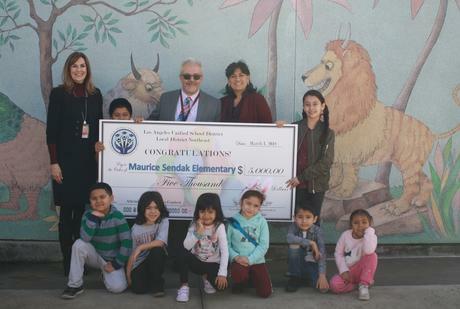 In February, Sendak Elementary won the District's Presidents' Day Attendance Challenge and got rewarded with a $5000 check. Our Local District Superintendent Mrs. Linda Del Cueto challenged all the schools in our district to have the best attendance the days before and after the Presidents' Day weekend. Well, our students and families came through, and we won that challenge. Mrs. Del Cueto and our Director Mrs. Nichols presented the big check to our school, which is on display in our main office. We will be using the $5000 to help us purchase a computer cart with 32 Chromebooks. Let's keep up the excellent attendance all year long. Remember to be at school every day and on time! 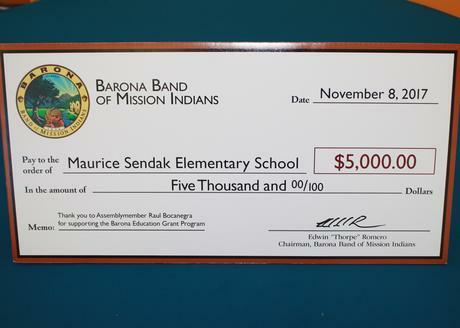 The Barona Band of Mission Indians awarded a $5,000 grant to the Sendak Arts, Communication and Technology Magnet Center to help in purchasing resources and technology for our magnet center. We want to thank the Barona Band of Mission Indians for selecting us as one of their grant winners and to our assembly member's office for their support. If you have not applied to attend the Maurice Sendak Arts, Communication and Technology Magnet Center, the Late Application process for 2018-2019 begins February 1, 2018. It allows applicants to apply for Magnet programs that may have openings. Applicants will be called by the school site when an opening becomes available. You may apply online at eChoices.lausd.net or use the paper application found in the Choices brochure that you can pick up in the Main Office. 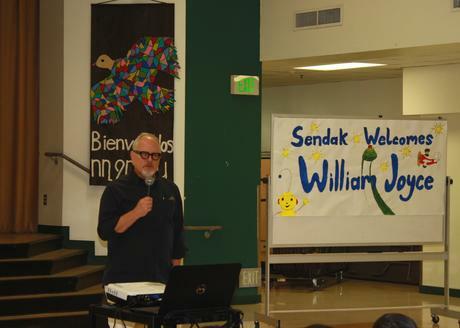 Author, illustrator, and filmmaker William Joyce visited Sendak Elementary in October to share some of his books with our students. Mr. Joyce has written and illustrated over 50 books, inculding George Shrinks, Santa Calls, Dinosaur Bob, and the Guardians of Childhood series. He has won an Emmy award for his Rolie Polie Olie show and an Oscar for his animated short film, The Fantastic Flying Books of Mr. Morris Lessmore. Click here to visit Some Stuff by William Joyce. Mr. Joyce shared with the students his love for illustration and making up stories. He told stories of his Superman suit that needed to be returned because it didn't work and about dinosaurs that got revenge on his older sister. He also shared how Maurice Sendak and the book Where the Wild Things Are inspired his creativity in drawing and telling stories. He even created a story on the spot that involved Boogers with super powers! Mr. Joyce so much enjoyed his visit to Sendak Elementary and talking with the students that he has asked to come back again next year. Thank you again Mr. Joyce for sharing your books and love of illustration and story telling with us. CONGRATULATIONS to Sendak Elementary. On Tuesday, May 9, 2017, the Los Angeles Unified School Board approved the application for our school to open a magnet center on our campus. The Maurice Sendak Arts, Communication and Technology (ACT) Magnet Center will open during the 2018-2019 school year. This will offer our community students a great opportunity to enrich their learning experiences and empower them to reach their true potential in exploring and expressing their unique abilities and talents. The ACT Magnet Center will create a learning environment where the integration of the arts enhances the daily instruction and fosters 21st Century Skills, including but not limited to communication, creativity, collaboration, and critical thinking. As a magnet center, we will open the 2018-2019 school year with one magnet class in each grade from 1st through 5th. Parents will be able to apply to the Sendak Arts, Communication and Technology Magnet Center through the CHOICES brochure when it is available in August/September 2017. Student selection will be made by the Magnet office. Thank you to the writing team for the time they put into the application process. Thank you to the parents for their support and feedback. And thank you to the community members and businesses who will be our Magnet Center partners. Ultimately, this is for our students, families, and community. On September 28, 2016, the Office of Assembly member Patty Lopez honored school leaders, parent engagement advocates, and parent volunteers who go above and beyond the call in supporting their school and the community. The included an awards ceremony and reception with refreshments for families that attend schools in the 39th Assembly District, which are most LAUSD schools in the Local District Northeast region. Sendak Elementary was represented by Parent Volunteers and Representatives: Amparo Alvarado, Ana Diaz, Maria Estrada, Erika Gomez, Claudia Lozano, Blanca Mendez, Maleta Welch, and Carmen Zombrano. This community ceremony commemorates a California State Assembly proclamation put forth by Assemblymember Patty Lopez declaring the month of September as Parent and Community Engagement Month in the State of California. Having good attendance means a student is absent less than seven days for a whole year. The school day begins at 8:00 AM and ends at 2:25 PM. On Tuesdays students will be dismissed at 1:25 PM. Congratulations to Sendak Elementary! Thank you for bringing your child to school. Due to your efforts, our school won the Attendance Award of $5,000 for the month of February. Keep it up! School attendance is important to student achievement. Students who develop patterns of good attendance are more likely to be successful academically and socially. When students attend school, they get better grades, score better on standardized tests and are more likely to go to college. Please bring your child to school on time. After the third consecutive absence day, please provide a medical note. Our goal is 100% attendance. The School and District Parent Family Engagement Policy along with the school parent compact was sent home November 30, 2018.